Australia - Carnegie Wave Energy’s 100 per cent owned subsidiary, Energy Made Clean, is set to develop and demonstrate a commercial-scale solar and battery storage plant in Australia, after entering into a joint venture targeting Australia’s vanadium redox flow (VRF) battery market. Carnegie said on Tuesday that EMC had signed a memorandum of understanding with Japanese company Sumitomo Electric Industries and ASX-listed TNG Limited to assess the potential applications of VRF batteries in Australia through an initial joint demonstration project. The deal builds on a June 2015 MOU between EMC and emerging strategic metals company TNG, to establish the feasibility of Vanadium Redox batteries. And it comes less than two months after Carnegie took full ownership of the Perth-based EMC, which has established itself as one of the Australia’s foremost micro-grid and battery storage businesses. Energy Made Clean’s main role in the partnership will be to identify commercial project site opportunities, while also designing and supplying a compatible balance of plant – likely to include solar PV – to integrate with the VRF containerised system being supplied by Sumitomo. 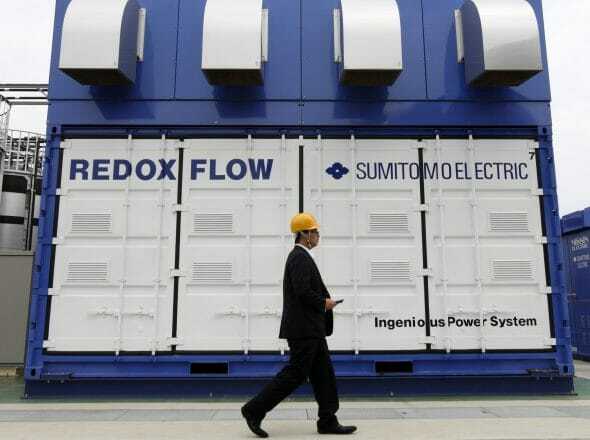 The demonstration will be of commercial size, to best showcase Sumitomo’s technology, the companies said; with each party contributing to their core competencies, and subsequently cooperating on the marketing and sales of VRF batteries. As we have noted on RE before, vanadium redox flow batteries are tipped to be one of the key players in the booming global energy storage market, as more and more renewable energy sources are brought onto grids around the world. The batteries are considered uniquely suited to on- and off-grid energy storage applications due to their scalability and long asset lives, with deep and very high cycling capability. Australia, as well as being a key market for battery storage uptake, has been noted for its potential to become a top global producer of vanadium – a metal found in a range of mineral deposits. A number of Australian companies are already active in the local vanadium redox flow battery market, including miner Australian Vanadium – which recently inked a deal with Germany battery maker Gildemeister Energy Storage to sell its CellCube range of VRF batteries – and Brisbane based battery maker Redflow. Energy Made Clean CEO John Davidson said the signing of the MOU would bring key industry innovators together to help revolutionise the vanadium redox flow battery market in Australia. “This strategic MoU represents a compelling three-way tie-up of an emerging miner, a manufacturer and an integrator to accelerate the development of a major new energy growth market,” Davidson said.